Hydrent Water Ionizer Machines & Filtration Systems. SMPS Plus power system and LCD touchscreen are more advanced features than we've found in other 5-plate water ionizers. 185 watts of power is another "stand out" feature when compared to other 5-plate models. Voice guided controls. Adjustable presets. Only 5 plates. Warranty limited to 5 years on parts and labor. No color options. Lacks bells and whistles found on more expensive models. For $1,495 it's hard to go wrong with the Hydrent. Although this model lacks some of the bells and whistles found on higher end water ionizers it still stands out when compared to other 5-plate models. The Hydrent is a solid performer and we were impressed to find touchscreen convenience available in this price range. If you're on a tighter budget, you'll probably come back to this model a few times before making your final decision. But don't let the price on this model fool you. The Hydrent has several stand out features when compared side-by-side to other 5-plate water ionizers. For starters the Hydrent water ionizer operates at a maximum of 185 watts of power. We looked around and the only 5-plate model we found with more available power was Enagic's DXII which sells for close to $3,300 and uses the old transformer power system. The Hydrent uses an SMPS Plus power system that gives individual users over 50 different power setting adjustments. This SMPS Plus power system let's the user maximize performance at the individual presets. Paired with the five platinum coated titanium electrodes, each measuring 5" x 7" this little gem is capable of producing a pH range of 4.5 to 10.5 with respectable ORP readings in most source water areas. This model also offers a large dual filtration system. Multiple layers of ceramic, carbon and UF mesh filter out common contaminants and bacteria for the cleanest possible water. The advanced ceramics not only help eliminate bacteria but also react with source water minerals to precondition the water for the strongest possible ionization. Filter life is monitored by an internal sensor and the unit will sound an alert when it is time to replace the filters. Users can also check the remaining filter life at any time by touching the filter indicators on the touch screen display. In most cases you can expect to replace the internal filters about once every six to nine months - which is about average for most water ionizers. Advanced features include LCD touch screen, automated shut-off, timed automated cleaning and "Concierge Voice Service" with on-screen visual alerts. The LCD touch screen makes day to day use easy - your pH level selection on the screen is the on/off mechanism for the unit. Each selection is confirmed by the Concierge Voice Service with visual alerts that continue as long as water is being produced. The touch screen color changes to orange when producing water at the acidic settings and blue when producing alkaline or filtered water. To prevent overflow or excess water waste, the Hydrent has a timed automated shut-off mechanism. After 15 minutes of production at any single level, the unit will assume that it has been unintentionally left running and shut itself off. The unit can be restarted at any time without any waiting period. For households with children - or just forgetful adults - this can be an important and money-saving feature. The Hydrent's automated cleaning cycle helps prevent excess scale buildup which is the primary cause of a water ionizer's loss of performance over time. About twice a day you will notice the display screen flashing between blue and orange. This is the cleaning cycle indicator. You can activate the cleaning cycle by touching any alkaline or acidic preset on the display screen. The Hydrent will run a brief cleaning cycle and then begin producing water based on your screen selection. You also have the option to use the "RTR" control panel feature. By using this feature you can start the cleaning cycle and walk away - as soon as the brief cleaning cycle is over, the unit will turn itself off - no waiting on your part. There are water ionizers with better warranties but not in this price range. While you don't get the 7-year or lifetime warranty offered by more expensive, higher-end water ionizers you can count on full protection covering both parts and labor for 5 years. 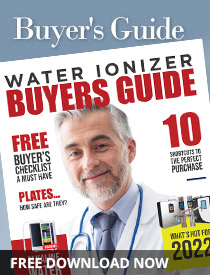 Overall the Hydrent is going to be tough beat if you're on a "5-plate water ionizer" budget. Good price, solid performance, nice features with a clean design. Advanced Features With the incorporation of a highly advanced, next generation processor, the Hydrent water ionizer has bragging rights to a full range of features.